My small town along the river, nestled into a little valley, is no stranger to fog. Sometimes in the early morning hours while I'm driving to work the river appears to be on fire, the fog rolling off the riverbank like smoke. 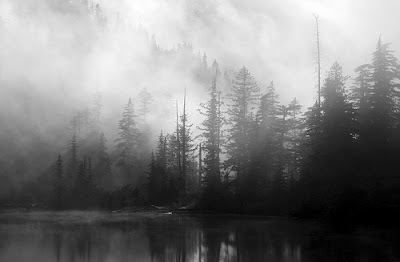 Other times, a thick heavy fog settles in, the kind that that greatly reduces visibility in all directions. For the past few weeks, I've felt like I was trapped in a thick fog, that at times I wasn't able to see my own arm stretched out in front of me. A combination of events left me feeling emotionally and physically drained, so I decided to step away for a bit. I needed to rest my soul and spirit, to allow my emotional well (which had been sucked dry) to fill up again. I needed to find my way though the undesirable fog that had so quietly and unknowingly seeped into my life. Thankfully after a week away, the fog is lifting and I'm feeling much more like my usual self. I no longer feel as if I'm moving ahead blindly, but have instead greatly improved my visability. I've regained my balance and found my center. I am ready to move ahead into February refreshed, refocused, and reenergized. Thank you to my wonderful friends Amber, Chickbug, Lisa, and Kay who all filled in for me. I truly appreciated your posts and your willingness to step in on such short notice. So happy you're feeling better, Mandy. I always said that we sometimes need to take a step back before moving forward. Glad you were able to rediscover your focus over the last week. YAY!! I'm so glad you're back! It was great to guest blog! For the past month somedays I feel like I'm not in a fog at all but other days it's so thick that I don't want to move because I simply don't know where to move to. Sounds like February is going to be a great month for you - good for you on the refocus! I'm glad you're back. One of the many things I admire about you is your constant ability to reinvent and come up with new and great ideas. I am so glad the fog has lifted! That picture of the fog is spooky. I got a little scared. We all get times where we feel that things are just too clouded and unclear and I'm so glad that you've managed to rest your soul for a bit. There's nothing like a break away from everything to just get centered again.